Fiji international Josh Matavesi and his younger brother Joel will join Newcastle Falcons in the summer. 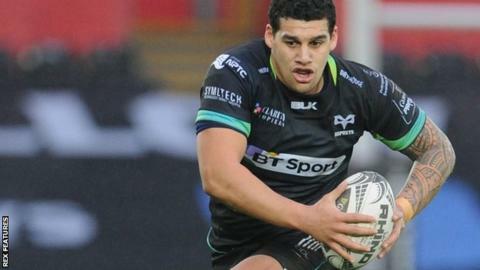 Centre Josh, 26, will arrive from Ospreys while his 21-year-old fly-half sibling, Joel, joins from Redruth. Josh was in the Ospreys side that beat Newcastle in the European Challenge Cup last month and will stay with the Welsh side until the end of the season. Director of rugby Dean Richards said he was a "proven and versatile performer who fits out style of play." Richards continued: "I'm sure our supporters will enjoy his flair and the impact he can make on the game. "Joel is a very promising young talent who is looking to make the step up. "It all points to very exciting times when we look at how the squad is coming together for next season." The double signing follows last week's recruitment of Leicester Tigers centre Maxime Mermoz. Josh Matavesi, who has 17 caps, told the Falcons website that the ambition of the club "really sold it" for him. However, he said he was wary of the threat his younger brother could provide. "He could be taking my spot in the team, so I have to be careful," he added. "Hopefully the fact I am here with him will help get the best out of him, but he is definitely a big talent and it will be great to share this experience together."